I only shipped one kind-of-RTS game (Artist Colony iOS) so I don’t have to much experience with RTS games. The main challenge here is to prepare proper communication with spectator (camera), HUD and Controller. It’s complicated and easier to accomplish using C++ but I will use Blueprints as requested. Let’s start by creating interfaces that will help us with communication. With one Vector input named Location. It will be used to tell units where to go. It will be called each time we start to click. With one float input named HoldTime. Will be called after releasing RMB. Will be called when we should select an unit. Called when unit should be deselected. Next step is to create some helping Enums. It will be used to choose in which direction we are scrolling camera. This will store state of input. For example when player is scrolling it will be set to Scroll. Now we need to configure our project. Add new Trace Channel named CamScroll. It should be set to Ignore as default. When dealing with RTS camera movement we need to do some line traces from mouse to the ground. Creating new Trace Channel for this will be helpful as we will only use this channel to check the ground. Now in your level place BlockingVolume which should imitate ground. 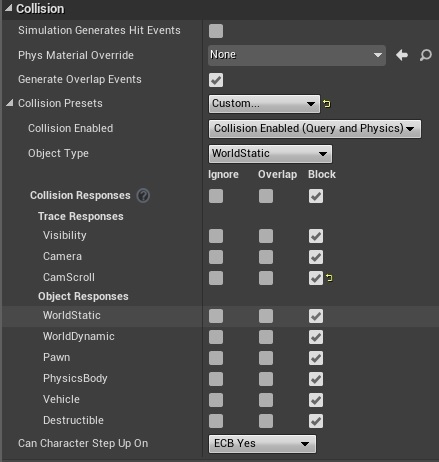 Make sure you changed Collision preset to Custom and Block CamScroll. This way our line traces will work with this BlockingVolume. By default this volume is really small and should be scaled up on X and Y. USEFUL TIP: When scaling Volumes it’s always better to use Brush Shape (box extend) instead of normal scale. I have found that scaling sometimes create weird behaviors with overlaps / hit events. And that’s all that need to be prepared. For my opinion the best Pawn for dealing RTS camera movement is SpectatorPawn as it can be Possessed and don’t have any mesh. Create new Blueprint extending from Spectator Pawn named RTSSpectatorPawn. Open it and add two new components: SpringArm and Camera. Now Right Click and find ZoomOut and ZoomIn input events – they should be visible after adding them in Project Settings. (Project Settings -> Input) If you can’t find them please go back to Project Settings step in this tutorial. So basically we are decreasing and increasing DesiredCamZoom float value. Easy as that. Now we need to drive this value somehow. Next step is to move the camera. There will be one Player Controller responsible for movement. Create new Blueprint extending from Player Controller named RTSPlayerController. StartSwipeCoords Vector Storing OnTap mouse coordinates. EndSwipeCoords Vector Storing OnHoldingEnded mouse coordinates. CurrentInputState EInputType Holding current state of input. Make sure it’s NONE as Default. isScrollingCamera bool Is currently scrolling camera? InputHoldingTime float Accumulated time while holding mouse. isHoldingInput bool Is currently holding mouse? SelectedPawns Actor Array Reference This will store all selected Actors reference. 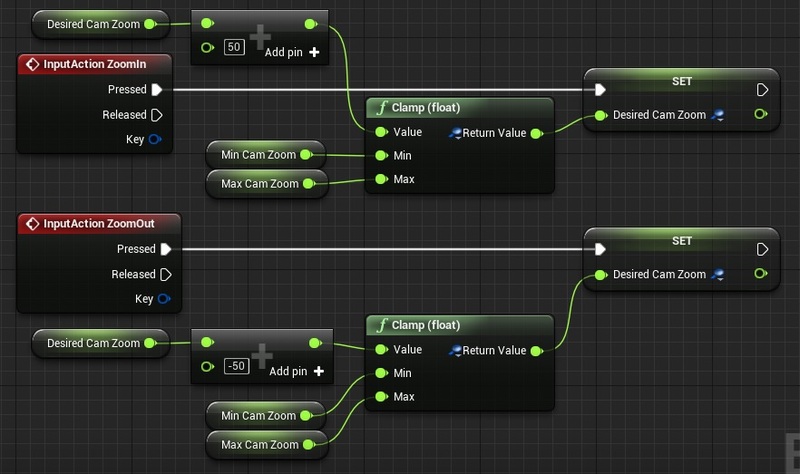 MoveClickTime float Accumulated time for moving units. WantToMove bool Want to move units? Lot of variables. It’s easier to create in C++. Now in your Event Graph create new Functions. This will store hit location with CamScroll channel. One Output: Vector named Delta. This function is adding and returning offset from starting vs current mouse position. Thanks to this we will be able to move our spectator pawn. This function is responsible for letting know if we want to scroll the camera. 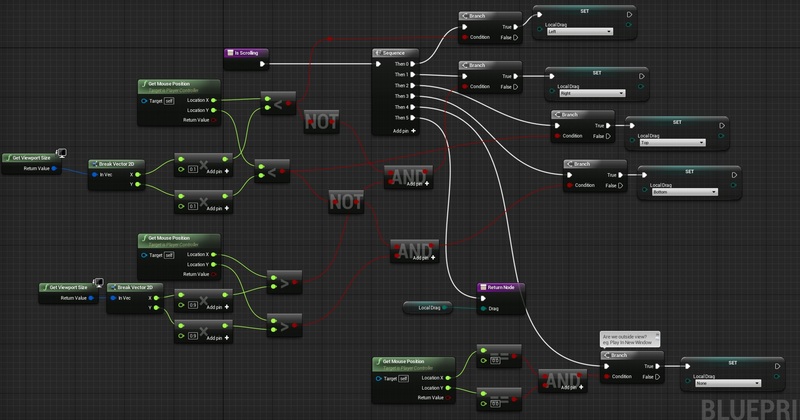 Doing such “IFS” in Blueprint isn’t the best way. In C++ you would have simple if statement with else if. That’s why it’s easier to do such stuff in C++. This is basically checking if our mouse is near top/bottom/right/left corner and if yes – return ECameraScroll enum. With one input named SelectedPawns: Actor Reference Array. With one Output named Direction: Vector. 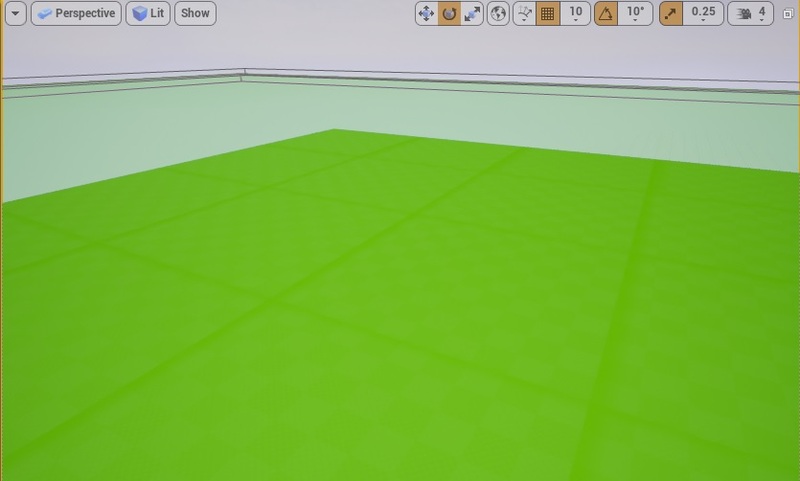 With IsScrolling function you can add movement input with some direction but I want to add some smoothing. This function is able to return direction based on mouse position rather than top/bottom/left/right side of screen. Thanks to this scrolling will be smoother. This will actually scroll and move our camera. You can call this in Tick to check it out. Be sure your RTSSpectatorPawn is possessed by this controller. This is responsible for swipe camera movement. This is responsible for selecting units input. It’s letting know HUD that we are holding mouse button. It’s just updating accumulated time in MoveClickTime so we won’t move the units when trying to move camera. This is creating 2×2 grid (just for testing) and calling MoveToMouseLoc interface on SelectedPawn. Which will be null for now but this will change in a sec. That’s all in PlayerController. Make sure your Game Mode default pawn is RTSSpectatorPawn and default controller is RTSPlayerController! Create new Blueprint extending from HUD named RTSHud. Make sure it is set in your GameMode as default HUD. OnTapMousePosition Vector2D Hold mouse position on click. HoldingMousePosition Vector2D Holding current mouse position. isDrawingSelection bool Is currently drawing selection box? FoundActors float Stores all actors in selection. SelectedActors float Stores actors that implements IMovable interface. Those should be self explanatory. This is for debug – drawing selection box so you can check if it’s working correctly. Look at Get Actors in Selection Rectangle function. It will return all actors in box selection that I’m doing. After that I’m just checking if the actors implements Selection Interface and call Selection Gained on Them. After releasing mouse SelectedActors will be passed to PlayerController. Now let’s make a test. Create new blueprint extending from Character named Pawn. Open it and make sure its implementing Selection Interface and IMovement interface as well! 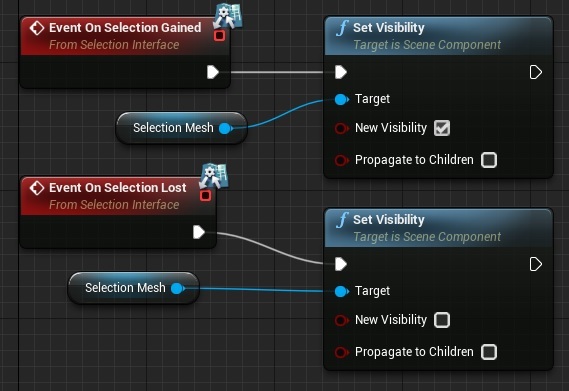 When ready add new static mesh component named SelectionMesh. Make sure visibility is set to False. It’s just debug mesh that will be visible when this Pawn will be selected. 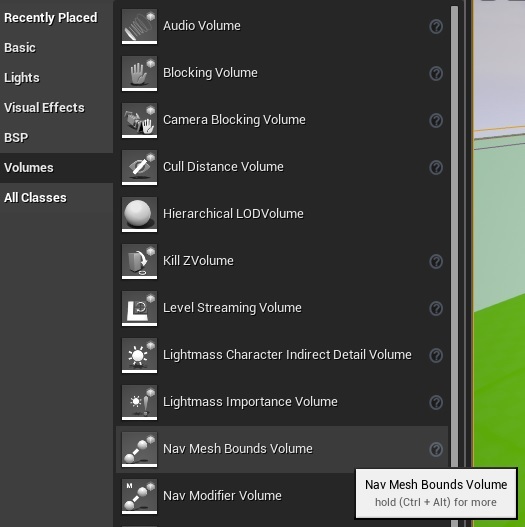 This should be place when you want to change material / add mesh when unit is selected – or maybe show some UMG widget. It depends on you and your game. And that’s all! 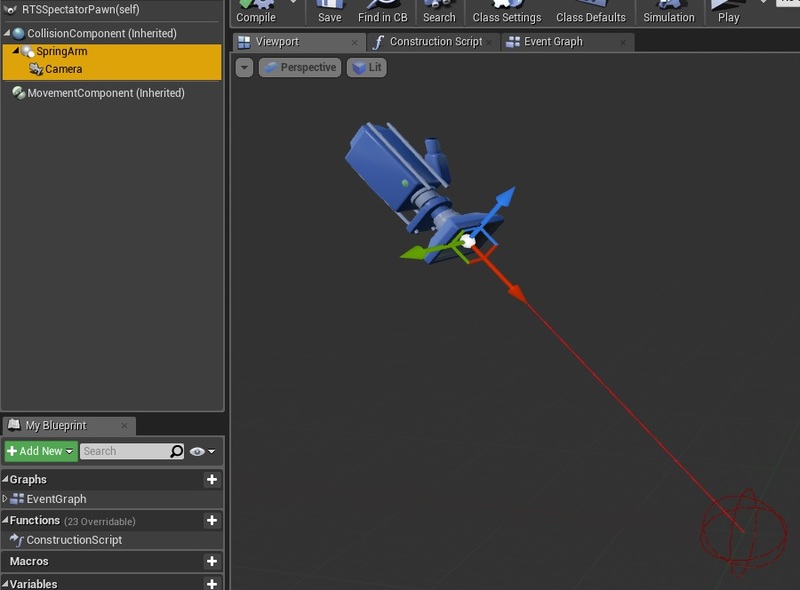 If you like you can select CharacterMovement component and enable RVOAvoidance. You can download whole project (4.10) here. And after reading the whole article, I needed to set the gamemode up properly. After setting the default pawn, hud, spectator and controller, it all worked. Project is rared with 4.10.2 version. I’m using Windows so maybe that’s the issue. But you can recreate this stuff using Tutorial! Hi there! i tried to make this tut, but i’m stucked. In part of “And another input – SelectInput:” i can’t add/i have no “On input tap” and “On Input Hold Released” node. When we create it? You need to add it in Project Settings -> Input. Lets see here. Seems like you missed quite some bits. To start in the HUD Sections Varibles “Found Actors and Selected Actors says they are floats but they are supposed to be Actor Reference Array. Im not sure if this one is missed, but you need to imploment the BPISelecttionInterface in the HUD class to be able to call Selection Lost. This is from the Recieve Draw HUD Event. As Kiss said, There is a function in the BPIInput interface missing, On Input Hold Released. Just a heads up to let you know. Will it work for touch screen? Really appreciate the work you do here. The small variable fixes stated in the comments got this working almost perfectly for me. The one issue I’m having is that when i make a selection and click to make the pawns move, far too many debug spheres appear and the pawns move to the last sphere so I might point them towards the center of a level and they will move far away. Any idea what could be causing so many destination points to appear? Last parts of “Spectator Pawn – Camera Zoom” section. Where is the Target under Target Arm Length? I created a new variable and named it “Target Arm Length” but cannot get the “Target” part of it. Sorry, I am new to Blueprints and I am a worthless artist :(. Gomeh. Oops. Forget my question. I solved it. Yup I found the error. You missed one custom event not explained in the tut. 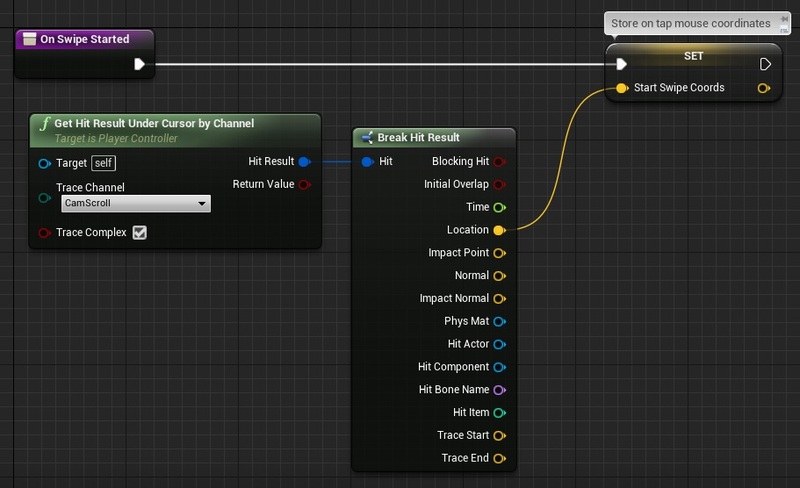 Download the Tut from the Link above, open it in Unreal (works even with 1.14) and open the RTS HUD. There is one new custom Event Called “CallOnSelectionLost”. It clears the Array. (All the red dots appeared because there were too many entries in the Array). After creating that custom Event in your own RTS HUD call it on the “Event Receive Draw HUD” on the “Then 1” Pin of the Sequence (like it is shown in the tut). Hello. Thank you for the tutorial. I followed it entirely and I have 2 problems, and I hope someone can help. First is that units becom selected even before the rectangle touches them. This is not a big problem but if there is a larger number of units crammed, then it will be harder to do at least a little bit more precise draw selection. Second one is a bigger problem. When no unit is selected, but they are all crammed in one place, when I select (Just LMB quick click) 1 unit in that group, all other units in a small radius become also selected. I have been trying to resolve this for the last 4 hours without any success. Hello, I’m just wondering. For “Is Scrolling” function, there’s a boolean function where it says “mouse x location is not less than 0.1 screen height and greater than 0.9 screen height”… Can’t I just pull the output directly from “mouse x location is greater than 0.9 screen height”? The two events are obviously mutually exclusive, no? Or did I miss something? Excellent tutorial, keep up the good work. Would you mind uploading the project to github so we can help you maintain it? I can help with PR-s to ensure it works on newer engine versions and occasional bug fixes.